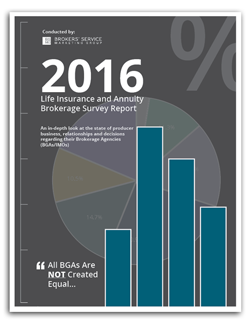 This free report will help Financial Advisors, Life Insurance Brokers, Wealth Managers and Estate Planners gain insights into the state of their business, sales landscape, practice needs and their relationship with their Brokerage Agency in relation to their peers. Industry feedback from top Financial Professionals on acquiring new clients, selecting agency partners, using technology in the field, overcoming underwriting challenges and more. A summary of the brokerage agency marketplace. Results of the study with in-depth analysis and brokerage agency satisfaction scores. What has your Brokerage Agency done for you lately? Questions? Call (800) 343-7772 today to speak with a BSMG representative.